Today we feature a selection of the most prominent artists who have answered the call of the Guinea Pig muses. Caroline is an artist based on the Isle of Wight. Caroline has over 15 years experience as a freelance artist and illustrator. Caroline specialises in gouache painting. Our review of Caroline’s book “The Flying Carpet” can be found HERE. Katie is an artist from the UK. Katie specialises in a cute kawaii style. 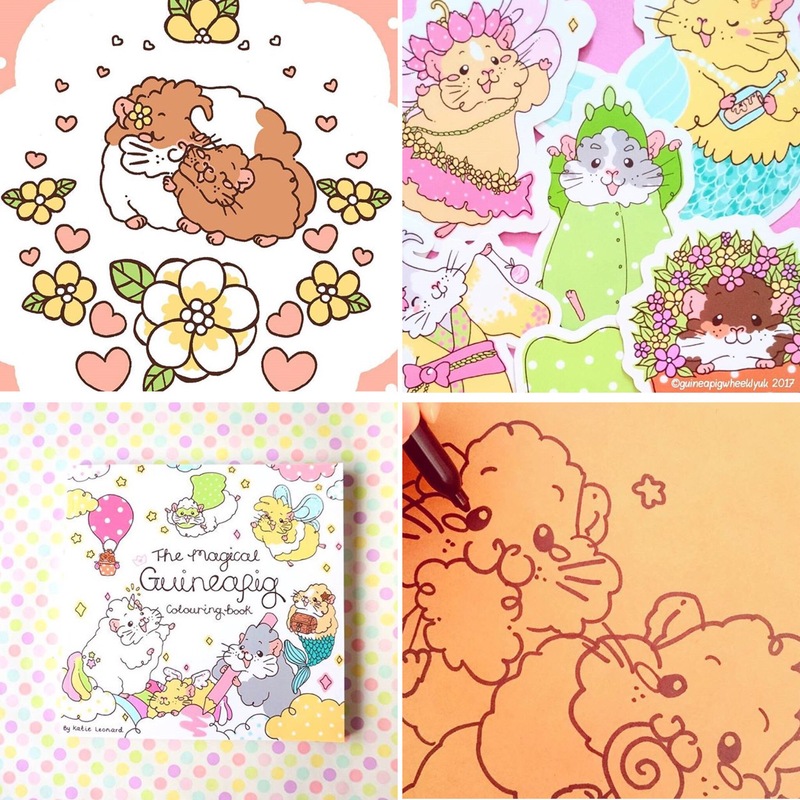 You can buy Katie’s Guinea Pigs on a variety of products from pin badges to cards and a colouring book. Our review of Katie’s colouring book “The Magic Guineapig Colouring Book” can be found HERE. Lesley is an artist based in Massachusetts, USA. 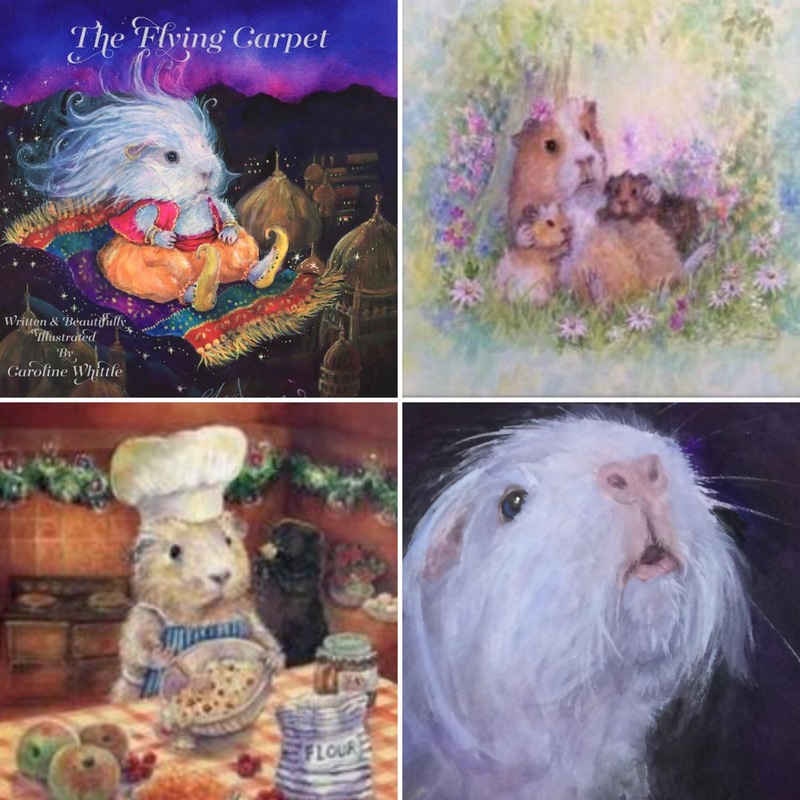 Lesley sells a variety of prints showing gorgeous Guinea Pigs in a variety of guises and adventures. 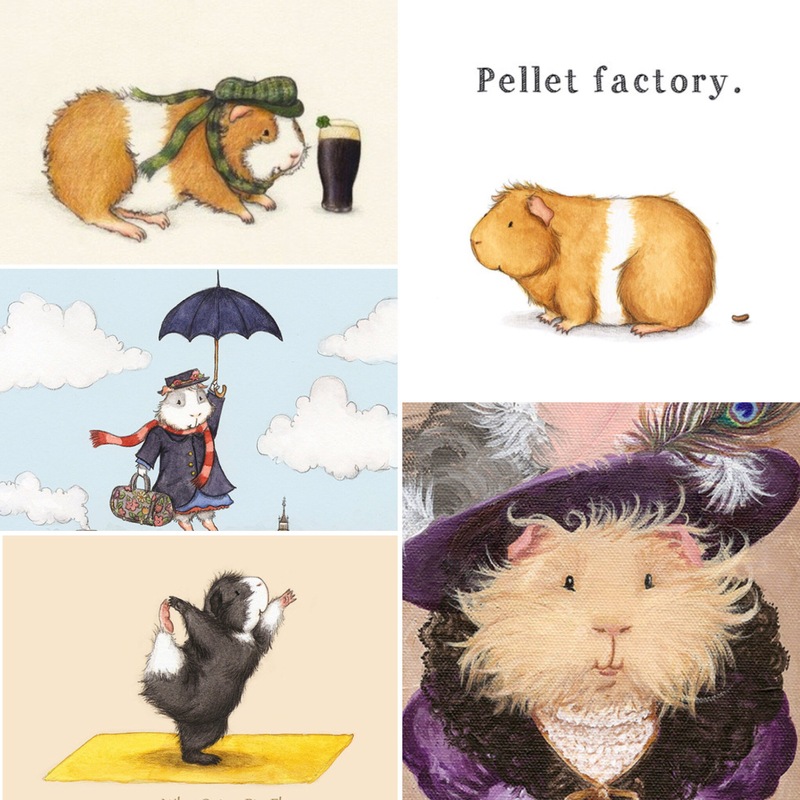 Of particular note is Lesley’s ‘Yoguineas’ series; adorable Guinea Pigs in a variety of flexible yoga poses. Perfect for the chilled out cavy lover in your life. All prints are printed on 100% cotton fine art paper and arrive signed and dated and packed against an archival mat board in a plastic sleeve, ready for framing. Not currently open to commissions. Laura is an artist based in Pennsylvania, USA. Laura specialises in watercolour portraits. 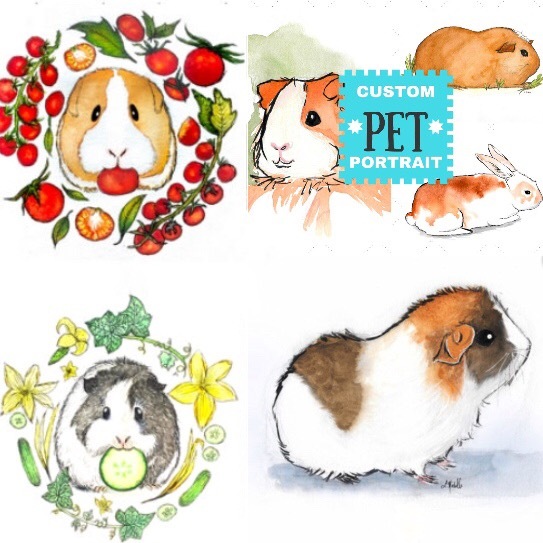 One of Laura’s particularly popular options is a custom portrait of your Guinea Pig surrounded by their favourite treats or toys. Charlotte is an artist and illustrator based Nottingham in the UK. Charlotte’s style is dreamy and ethereal. In addition to Guinea Pigs you will find flamingoes, unicorns and crystals in Charlotte’s shop. 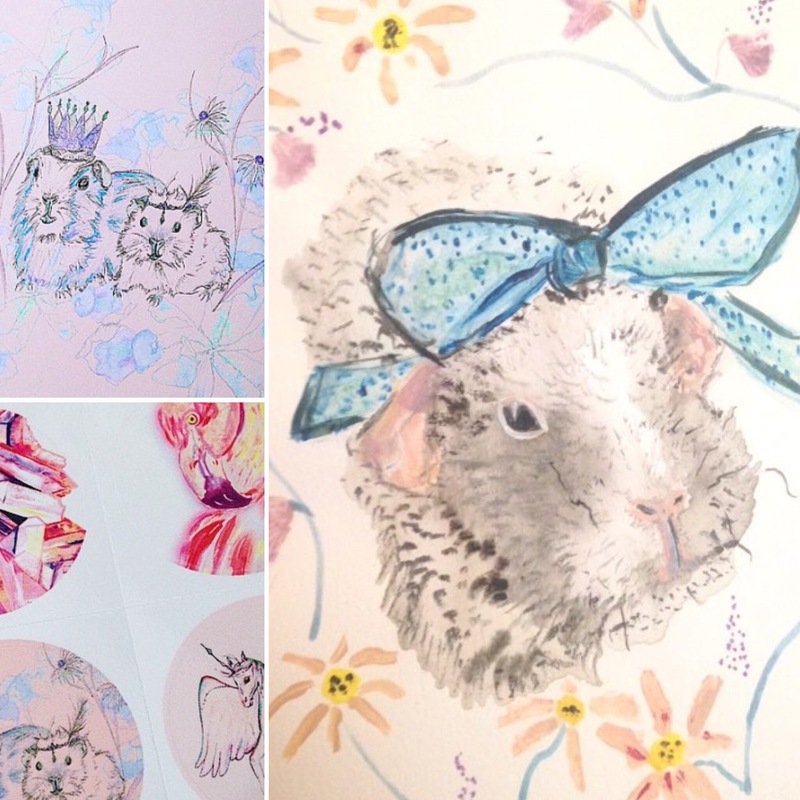 Are you an artist who features Guinea Pigs in your work? Please contact us for a feature. I am also planning a craft edition so if you knit, sculpt or otherwise create piggies please contact us too. These are lovely Squidg pigs. Do check my blog too, we are a family of Cats.